Novelty space: A wedding invitation with the TeamLease ad. New Delhi: It was a wedding invite, but for 24-year-old Ahmad Sheikh, it ended up being the passport to a new job. The invite—to the wedding of one of Sheikh’s friends—was like any other, except for the name and phone number of a recruitment agency printed at the bottom. Sheikh, then a salesman at a shop in Mumbai’s Crawford Market, called the number, and now works for a large consumer durables marketeer. The wedding was real, as was the invite, which was paid for by staffing services company TeamLease Services Pvt. Ltd. The invite resulted in 40 people getting in touch with the company, which eventually hired more than 20 of them. Bangalore-based TeamLease takes people on its rolls and then places them in temporary positions in other firms that do not want to be burdened with too many employees. During a discussion on how the company could increase its intake to meet demand, oneof TeamLease’s associates Mohsin Khan came up withthe idea of using wedding invitations. “Through this one channel, we could reach a large target audience," says Rajesh. “Although the idea was good, the question was, who would like to have a recruiter advertise on a wedding invite?" The company decided to test the idea and Khan coaxed a friend, who was getting married, into sharing space on his wedding invite with TeamLease. In return, the company paid for the invites. The results were all that the company expected them to be. 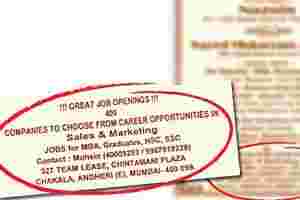 The hires were placed in “entry level sales jobs for retail, financial services, consumer durables and fast moving consumer goods?companies",?says?Rajesh. Like Sheikh, 24-year-old arts graduate Sunny Sehgal, who was working with Tata Teleservices (Maharashtra) Ltd as a sales executive, also landed a job through the wedding invite. He now works in the Thane, Mumbai, office of a large financial services firm as a sales executive and draws a salary of Rs14,000 a month. Sheikh’s new job pays Rs9,000 a month. The wedding invite is just one of the unconventional hiring methods being considered by TeamLease: the company is also looking to tap social networking sites, e-groups, alumni sites, blogs and matrimonial websites. TeamLease, which has 73,000 employees, is present across 480 locations in India and places people in temporary positions in companies from a variety of businesses, including banking and financial services, retail, pharmaceuticals, engineering, manufacturing, infrastructure, information technology, and telecommunications. The staffing company has seen business grow 110% to Rs560 crore in 2006-07; its staff strength rose 94.4% in the same period. The first (and perhaps the only) sponsored wedding invite was a pilot. Its success has encouraged the company to try and create a model of hiring built around wedding invites. But it wants to be sure first. “Sourcing is a very local thing and what works in Andheri (a Mumbai suburb) might not work in Vashi (a suburb in Navi Mumbai)," says Rajesh. “Also, there is this aspect of social acceptability in this method of sourcing and that has to be accounted for," he adds. Sheikh does not think there is anything wrong in using wedding invites to attractpotential hires. “Imagine going to a wedding where you not only have fun and good food, but also (end up with ) a job," he says. He adds that he would encourage his family and friends to “go for this kind of space sharing arrangement (with recruiters on wedding invites), since I want them to benefit from this".